Released on Nintendo 3DS, Pokémon Super Mystery Dungeon is a rogue-like and dungeon-crawling game, and the tenth one to be released in the Pokémon Mystery Dungeon series. The game showcases 720 Pokémon, up to the sixth generation, with 3D models and animations. It marks the return of some features, such as the Hunger feature, making dungeons far more challenging. 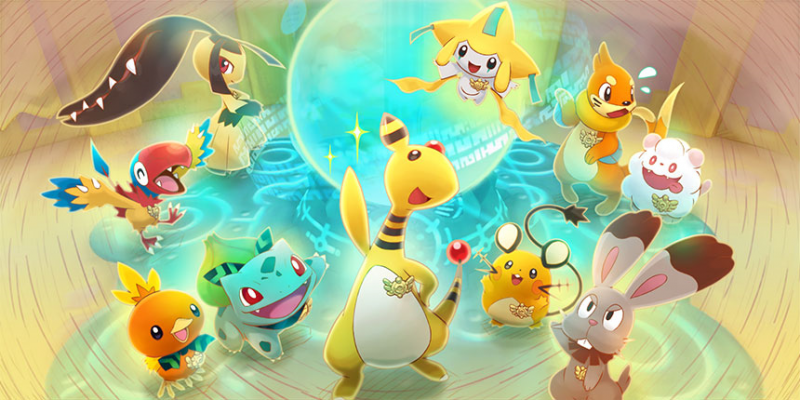 The game also includes many new features, such as the Mega Evolutions and the Alliance Attacks. Several continents with their respective dungeons are now available, giving the player wider areas for exploration. 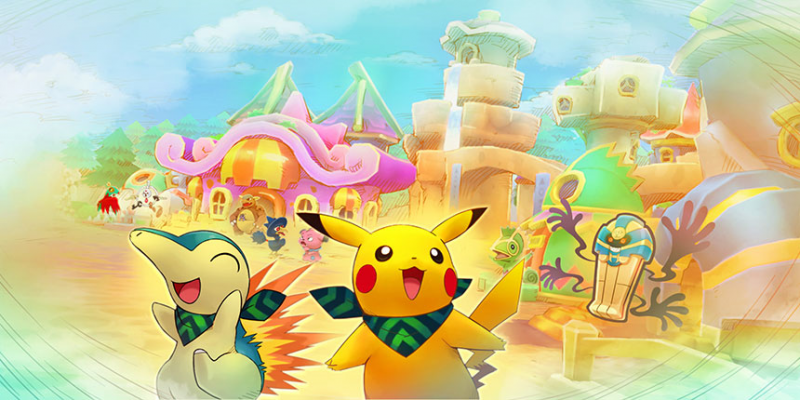 The game's plot is similar to all the Pokémon Mystery dungeon games, with the player transforming from a human to a Pokémon and being transported to the Pokémon world, which they will have to save. The Definitive Pokémon Mystery Dungeon Game! Become a Pokémon, go on adventures, and save the world! All 720 species of Pokémon! An unknown peril in the world of Pokémon? Battle your way through dangerous dungeons! The game starts with the player transforming from a Human into a child Pokémon and losing all memories of their human life. They get transported into the Pokémon world, and get attacked by three Beheeyem, as soon as they arrive. While trying to escape, they meet Nuzleaf who helps them lose the Beheeyem and takes them to Serene Village. Noticing that the player is very young, Nuzleaf enrolls them in Serene Village's school. There, they meet the partner Pokémon who dreams of drawing a complete world map, by joining the famous Expedition Society, an exploration group that only adult Pokémon can join. The player learns that the partner, who turns to be quite a troublemaker, is adopted by Carracosta who found them, along with Harmony Scarves. The partner gifts the player one of their scarves, after the player earns their trust. 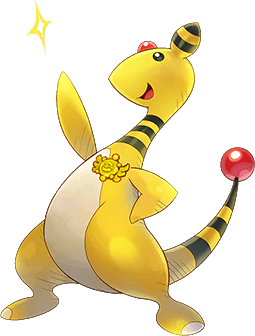 During some of their adventures, the Pokémon come across Ampharos who awards them with Junior Expedition Society Badges. One day Nuzleaf takes the player and the partner to the sacred Revelation Mountain, in order to seek information on the player's amnesia, but soon their expedition gets cancelled by the patrols there. The partner then, convinces the player to join the Expedition Society in Lively Town and the two head there. They reach their destination after a long and difficult journey, and soon find out that Ampharos was actually Expedition Society's leader. After talking to him, Ampharos removes the age restricting rule and lets the player and the partner join Expedition Society, becoming its youngest members. After doing few missions, the player hears rumors about how some Pokémon are being attacked and petrified.They later find Latias and Latios changed into stone after they fell from the sky, as they were petrified while flying. They also meet Entei who blames the player for the chaos that's happening. Some time later, Ampharos decides to take Expedition Society to the island where Entei lives, to further investigate the issue about the player. As they get there, a fight issues between Entei and the player and their partner. During the fight, the Harmony Scarves react weirdly, allowing the player and the partner to reach their final evolution for a short period of time and giving them enough power to face Entei. Ampharos arrives and puts an end to the fight, by calming both sides. 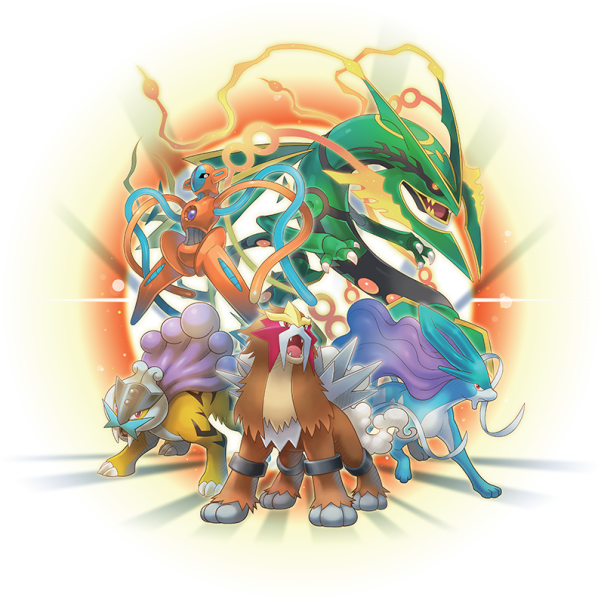 Few days later, the Pokémon of Lively Town start finding written warnings, stating that Entei would be the next victim of petrification and that only legendary Pokémon are being targeted. The Expedition Society members hurry to Entei's island, but they arrive too late, as they find him turned into a stone already. Everyone starts suspecting the local thug, Krookodile who's reputed for his bad behaviour. The Expedition Society then forms two groups, one of which will look for a cure to the petrification, while the other would go after Krookodile and bring him to justice and in which both the player and the partner are put. Krookodile's chase leads the player and the partner to the Revelation Mountain, where they meet Nuzleaf and find a shimmering lake at the mountain's top. The Pokémon are unable to access the lake, as it is protected by a pyramid-like barrier. Meanwhile, the team looking for a cure, finds that the Luminous Water of the lake would reverse the petrification process. Back to the player's team, the partner finds some ancient runes near the lake and deciphers them to discover that the lake's barrier can only be broken by a human. Suddenly, Krookodile appears along with the other two legendary beasts, Suicune and Raikou, who seek to take revenge for Entei. The player hurries and breaks the barrier and Krookodile announces that Nuzleaf was the one who paid him to spread the warning messages across Lively Town. Nuzleaf admits that he's the one behind the petrification accidents and summons Yveltal, turning Raikou, Suicune, the player, the partner and even Krookodile into stone. At the same time, the cure research team gets attacked by the Beheeyem and eventually turned into stone too. Expedition Society. As the group ventures through the Voidlands, they find several ancient runes, which the partner deciphers again. The runes tell the story of the Dark Matter, the ancient incarnation of all negativity, evil energy and darkness. This malicious force can turn Pokémon into stone and start feeding on their life energy. The Dark Matter tried once to possess the Tree of Life and destroy the world. Luckily, it was stopped at the right time. The group tries to find a way to exit the Voidlands, when they get attacked by the servant of Dark Matter; the Void Shadows who are dark creatures that can take the shape of any Pokémon. Some of the group get captured, while the others run away and eventually find the Door of Light. This door is the exit that leads back to the real world, but it is guarded by many more of Dark Matter's servants. A battle issues and what was left of the group tries to keep the Void Shadows busy, while the player and the partner go through the Door of Light. The player and their partner find themselves in the real world and soon learn that most of the citizens of Lively town and Serene Village were Turned into stone. Nuzleaf had also stolen the Luminous water from the lake and seeks to destroy it. Jirachi the astronomer of the Expedition Society seems to have worked with Ampharos to evacuated the shop keepers from the towns and hid them in the organization's headquarters. Later, the player and the partner stumble upon one the Beheeyem, that attacked the player when he first came into the Pokémon world. They attack him and the Beheeyem explains that he was under the influence of Dark Matter, who pushed him to do the evil deeds. He then states that he wants to guide the player and the partner to the Tree of Life. The two believe him and follow him. Unfortunately, as they reach the Prehistoric Ruins, they discover that it was a trap orchestrated by Nuzleaf. Nuzleaf reveals to the player was once the human who helped defeat Dark Matter. He then states that he fooled everyone, in order to gain their trust and get hold of the Luminous Water. That way, Dark Matter's victory would be assured. 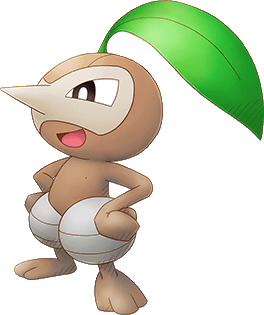 Moreover, Nuzleaf states that he ordered the Beheeyem to attack the player and their Psychic attacks caused the player to lose their memories. Just as Nuzleaf tries to petrify the player, Ampharos, Celebi and Jirachi appear and Celebi quickly teleports everyone to the Primeval Forest, the forest where the Tree of Life is located. At the Primeval Forest, Celebi retells the story of the human who worked with the Pokémon in order to put an end to Dark Matter's evil actions. The human from the legend is confirmed to be the player and it is believed that the legendary Mew brought him back to the Pokémon world, so they can save the world, once again. Furthermore, the player also learns that the scarves both the partner and them have, are created with Tree of Life materials. The scarves hold a portion of the Tree's power, which caused the Pokémon to evolve for a moment. The Pokémon hurry toward the Tree of Life, located in the center of Primeval Forest. To their surprise, the tree was already dying as Dark Matter finally possessed it. The group then battles Yveltal, Nuzleaf and the Beheeyem, defeating them and freeing them from Dark Matter's mind control. At that moment, Dark Matter lifts the Tree of Life into the sky and moves it toward the sun, while transporting Nuzleaf's defeated group into the three. Arceus contacts the player and their partner and urges them to enter the Tree's roots. At the same time, Ampharos had brought several flocks of flying type Pokémon that attack the tree in the air, while the three powerful Mewtwo Y, Rayquaza and Deoxys try to hold it in position. The player and the partner enter the tree's roots, in their evolved forms, and move toward the tree's core. On their way, the two save Nuzleaf and his group and ask them to leave. Once they reach the core, they find Dark Matter and the battle issues. Dark Matter teleports the two into another dimension, but they manage to beat the evil force and return. But Dark Matter wasn't fully destroyed and is able to regenerate. It transforms the player and the partner into their normal forms and send out dark waves which petrify the Pokémon trying to keep the tree in place. Moreover, Dark Matter kills the tree and mocks the player and the partner, as now, there's nothing to fight for. But the two believe that there's still hope and attack Dark Matter's barrier. They are soon joined by Nuzleaf's group who seek redemption. As the petrified Pokémon call for the player to not give up, the group keeps striking the barrier until they shatter it. Dark Matter's core shows up and the player and their partner attack it, putting an end to the evil force. Few moments before getting completely destroyed, Dark Matter states that it will return eventually, as there will always be darkness in some Pokémon's hearts. Surprisingly, the partner accepts Dark Matter's statement and tell it that it too, has the right to be. Then, the partner and the player attack the core one last time, breaking it to piece and finally putting an end to the chaos. The two get teleported back to the Primeval Forest where they meet Xerneas, the Tree of Life's embodiment. Xerneas announces that all the petrified Pokémon were back to norma, and that Dark Matter had found peace and is gone forever. 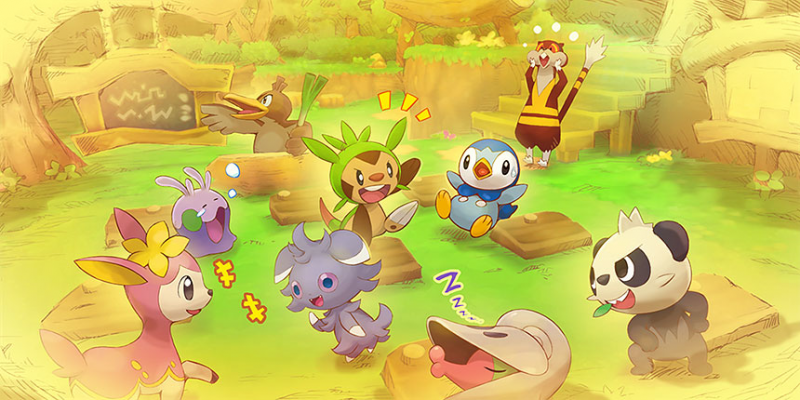 The Pokémon in Lively Town and Serene Village celebrate their success. Now that the crisis is over, the player knows that they have to return to the human world, but want to stay with their partner here, instead. The player goes to their partner to tell them about how they plan to stay, but the latter states that Xerneas returned its memories. It turns out the partner fought Dark Matter with the player in the past and is the incarnation of Mew. In their past battle, the player and mew failed to completely destroy Dark Matter, so Mew took some counter measures to prepare for Dark Matter's return. Mew created the barrier around the Luminous Water and erased both memories of himself and the player, to prevent them from redoing the same mistakes. Now, that he has completed his task, the partner says farewell to the player and fades away slowly. 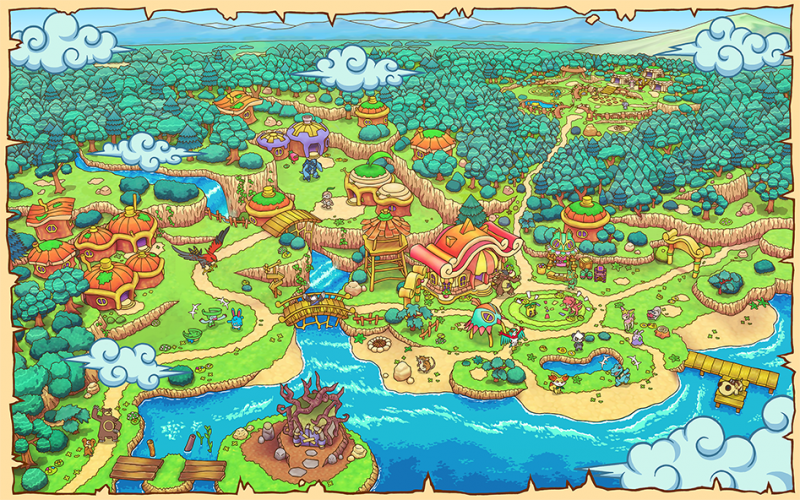 A map artwork of Serene Village. The player continues to work for the Expedition Society but is still saddened by their partner. Seeing the player in that state, Ampharos tells them to contact Xatu who might be able to help. The player visits Xatu in the Sand Dune of Spirit. Xatu tells the player that he had a vision about Mew, and that Mew is the link to restoring the partner. The player seeks Mew in the Mystery Dungeon, but it seems that Mew doesn't know who the player is, as all his memories are gone. Mew joins the Expedition Society and soon becomes friends with everyone. After doing some missions, the player wakes up and remembers that Mew was sick and they had to take him to Serene Village. There, they were attacked by some unknown Pokémon and Mew was kidnapped. After they meet Ampharos, the player learns that the Mew's kidnapper is trying to sacrifice Mew to prevent Dark Matter from ever returning. The player hurries to the Purifying Cave where the sacrifice would take place. They find Mew glowing and fading away and discover that Nuzleaf and his group are responsible for the act. The player's scarf resonates with the light emerging from Mew and the partner appears. Xatu, Ampharos and Mawile appear, stating that this was all an act they set, in order to see how much the player wanted the partner to return. The player and their partner return to the Expedition Society while Mew goes back to Mystery Jungle. All the Pokémon up to the sixth generation are available in the game, some of which appear as NPCs, and others as wild Pokémon and bosses. At the start of the game, the player may choose the old Quiz method, that picks a Pokémon for the player after the answer few Quiz questions. Or, they may directly select what Pokémon they want to play. The player may select the partner Pokémon with the same methods used for the Playable Pokémon's selection. The partner can be selected from the same list of the Playable Pokémon. Krookodile and Krokorok: Krokorok is the town's thug and Krokorok is his apprentice. The two have a bad reputation, as they are known for their mischievous acts. An artwork featuring many of the members of the Expedition Society. 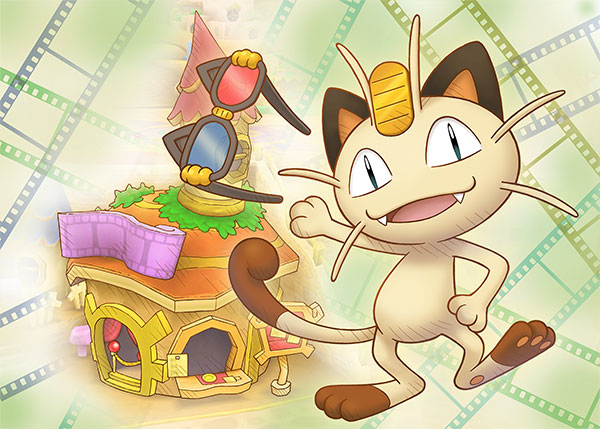 Meowth Meowth Theater Allows the player to film their adventures and watch them. The player can also watch the adventures of their friends. Lapras Lapras Travel Liner It allows the player to travel from a continent to another. Kangaskhan Café Connection Here, the player can meet random Pokémon each day. The player gets sometimes automatically connected to these Pokémon. 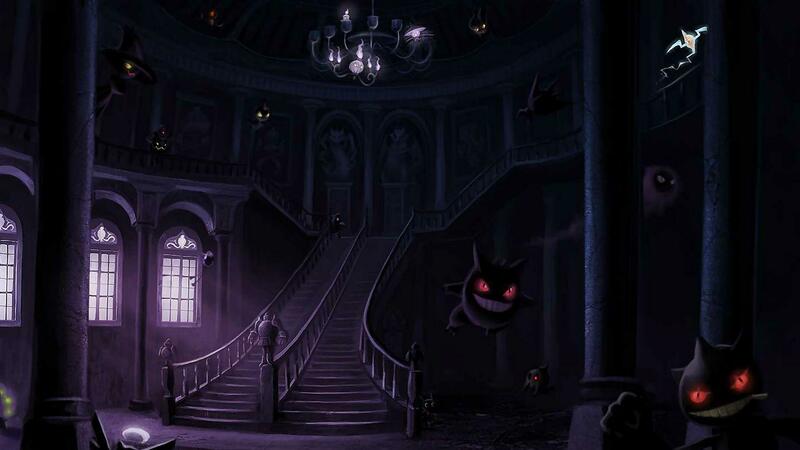 Some of the Pokémon might give the player a mission or a secret task. Kecleon Kecleon Shop The shop lets the player buy items such as food or TMs. It is also, where the player can sell items they don't need. Hawlucha Hawlucha's Slam School Hawlucha will let the player's team members forget some of their actual moves or abilities, and relearn forgotten ones. Cofagrigus Glorious Gold The player can exchange the Gold Bars they have for Poké or items here. Cofagrigus does also sell rare items. Klefki Rockin' Lock Opens the player's treasure boxes in exchange of a Poké sum. Simipour and Watchog : They are respectively the principal and the assistant principal of the village's school. 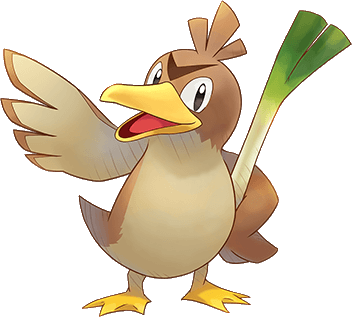 While Simipour cares only about the Pokémon Children's education, Watchog solely focuses on keeping the school's reputation perfect and then of course theres Farfetch'd: A very serious teacher that works in the village's school. An artwork of the school playground at Serene Village. Audino: The Doctor of the village and another teacher working at the school. Nuzleaf : He adopts the player at the start of the game and takes care of them, letting them live in his house. Carracosta : The partner's adoptive father. Nuzleaf : He deceived the player, under the control of Dark Matter, leading them to break the barrier around the Luminous Water, which lets them steal it. The Beheeyem : They attack the player at the start of the game, under the orders of Nuzleaf. Yveltal : A legendary Pokémon controlled by Dark Matter. He helps Nuzleaf and his group. Dark Matter : An ancient dark force that feeds on the negative emotions of Pokémon, enabling it to control them. Dark Matter is the game's last boss who seeks to destroy the whole world. The Pokémon moves can be upgraded again, as their ranks increase. The higher the rank, the stronger the Pokémon's moves. Some of the moves cannot be upgraded, like the moves that are based on factors, such as the HP%. The Jukebox features makes its return, allowing the player to listen to all of the game's soundtracks and even those from the previous Pokémon Mystery Dungeon games. Party size now takes the Pokémon sizes in consideration, affecting the number of Pokémon that could be taken in a party. The Belly Mechanic and the Deposit Box have also returned. 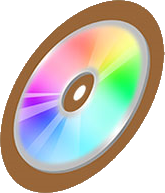 Normal TMs can only be used once, while the rainbow colored ones have infinite use. The playable Pokémon and the partner Pokémon can be chosen, once again, according to the player's answers to the Quiz test. The wild Pokémon in the dungeons, can evolve if they defeat one of the player's team members. The Speed stat was added to the game and unlike in the main game series, it affects the accuracy rather the Pokémon's speed. How fast a Pokémon can move during their turn is affected by their Travel Speed stat. Rewards can only be recieved after doing quests. Many large Pokémon like Onyx are made playable and they take 9 tiles, while moving in the dungeons. Counting the guest Pokémon, up to four can now enter the dungeons. 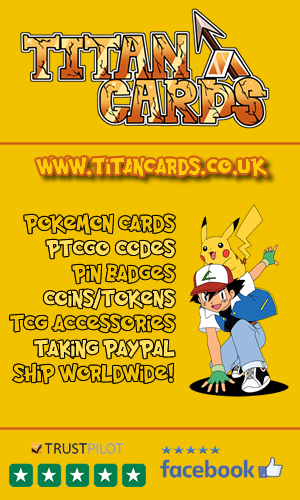 Many new stores are now available like the Meowth Theater and the Lapras Travel Line. Both the dungeons and the overworld now show the available accessories. The main menu's temporary save has been removed and the Progress Device has been added. This devices allows the player to save their progress, on any of the dungeon's floor. New items, which function same as the Orbs are added and they're called Wands. The Expeditions are no longer random, but actually preset and unchangeable. Power up items called Looplets have been added to the game, along with secondary items called Emeras. 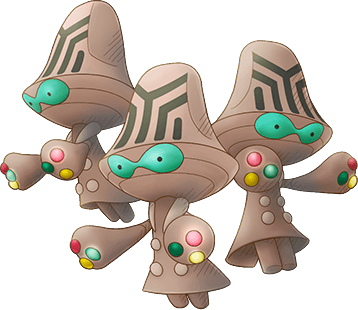 Emeras can be found in dungeons and put in the Looplets, allowing them to power up some of the Pokémon's stats. The game is the first one in the series to feature the Mega Evolutions. During some days, three of the connected Pokémon become Motivated and the player gets to know which ones the are at the start of the day. Motivated Pokémon earn Triple the normal experience from dungeons and quests. A new group attack has been added to the game, known as Alliance Attack. This attack instantly teleports the Pokémon around the enemy and they unleash a devastating attack. This attack depletes the Belly bar. Normally, if one of the Pokémon is far away, the attack cannot be used, except if they hold an Alliance Looplet. The Connection Orb now replaces the Bulletin Board. Pokémon can now only be recruited or more precisely "connected" after finishing requests they're linked to, from the Connection Orb. Some of the Pokémon get automatically connected as the player progresses through the story, or simply by speaking to them, like some of the Pokémon in Café Connection. Check out these videos from Pokemon Super Mystery Dungeon including the intro/opening video as well as the trailer and some TV Commercials. 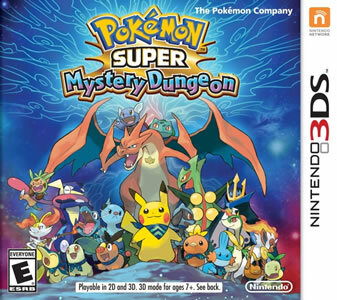 Pokémon Super Mystery Dungeon is said to be linked to the previous games, as some of the dungeons from the previous games are replayed in this one, like Wish Cave and Destiny Tower. Unlike the other Pokémon Mystery Dungeon games, it's the partner that disappears after the story ends and not the player. The game offers the largest playable Pokémon selection in the series. PSMD International Logo (left) vs. Japanese Logo (right). Within the first three weeks of its release, the game managed to sell around 216 thousand copies in Japan, 92 thousand in Europe and nearly 159 thousand in the USA. The sales to increase, reaching a total of 350 thousand in Japan, 441 thousand in Europe and almost 467 thousand in the USA, with a final global number of 1.39 million copies. On GameRankings, the game received a good score of 69.11%, over 23 reviews. On Metacritic, Pokémon Mystery Dungeon also received another score of 69%, this time aggregated from 44 critics. 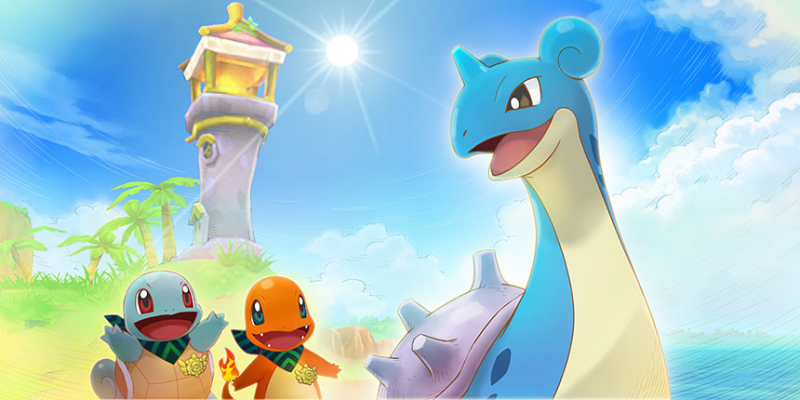 Overall, Pokémon Super Mystery Dungeon managed to capture the genre's mechanics. But, similarly to the other games from the series, it soon gets repetitive and boring, as the requests and missions are very similar.